Dietetics Today explore the benefits of the Mediterranean diet for diabetes management. 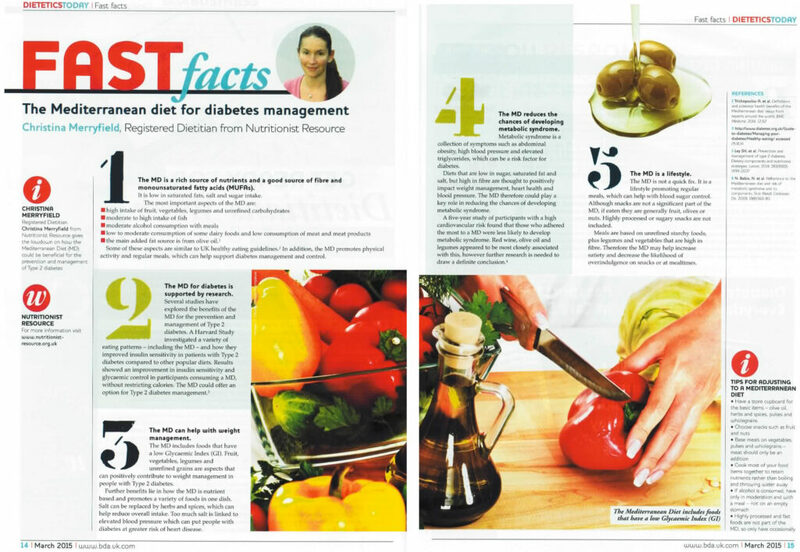 Nutritionist Resource has been featured in the official British Dietetic Association (BDA) members’ magazine, Dietetics Today. In the March issue, registered dietitian Christina Merryfield gives the lowdown on how the Mediterranean diet (MD) could be beneficial for the prevention and management of Type 2 diabetes. Extensive research links the Mediterranean diet to improved health and well-being, and significantly to the prevention of common diseases such as Type 2 diabetes. On behalf of Nutritionist Resource, Christina explores what the MD entails and how it promotes a healthy lifestyle and weight-management – both key for reducing diabetes risk. If you are a member of Nutritionist Resource and would like to get involved in future press opportunities, please email us at press@nutritionist-resource.org.uk to be added to our list.